beer, special previews, and some kegs from our cellar! We’ve raided our cellar to have special taps on all day. Our new sour red, Magnus, will be on tap, in anticipation of the bottle release scheduled for April 15th. Our brand new Klein Bruinwill also be on tap. Klein Bruin is a sour brown ale, tart, bright and lemony with a toasty malt finish (the name means “small brown” in Dutch). We have just one log left of Pomology: Apricot, so that will be samples only, as well as Pomology: Cherry. (Don’t worry, this year’s batch of Pomology: Apricot has already been re-brewed and is aging!) With such a limited supply, some of the beers on tap will run out early in the day, but we have other beers lined up to fill those lines when that happens! 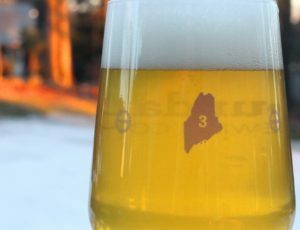 Our third anniversary glasses are a similar style to the glass from last year, with a new color and a year 3. They are available at the brewery for $7. Tacos del Seoul will be on the patio, serving up their wonderful Korean/Mexican fusion, including some special menu offerings. Our friend, The Professah, will be in-house spinning his eclectic collection of Reggae vinyl. When some of those kegs kick, we’ll also have on Zuurzing (Sour Farmhouse) and Fading Light (Dark Ale with Brett, *Howlers and Samples). Our new canning line has been busy, and we’ll also have the following cans available to-go: Epiphany (small amount), Venture, Afterglow, Riverton Flyer, Bedrock and Burnside. There is also a limited number of Dark Side Corruption (Oak-Aged Ale) and Mortimer (Stock Ale) bottles available to-go. We are also excited to be introducing a new collaboration product in our merchandise area — fleece pullovers with the Foundation Brewing logo from local manufacturer, American Roots. These fleeces are 100% American-made, union-made in their small factory right here in Portland, Maine! We hope to see you on Saturday! Thanks for your support and enthusiasm for our beers throughout the last three years.